Will advertisers flock to Richard Sherman? Richard Sherman could stand to make about $5 million in endorsements -- all because of his 15-second rant moments after helping the Seattle Seahawks get to the Super Bowl. Sherman, a defensive back, made the play that secured Seattle's 23-17 win over San Francisco on Jan. 19. Immediately after the play, he did a TV interview proclaiming that he was the best cornerback in the National Football League, and dissing the opposing player who he had foiled on the play. Sherman's agent, Jamie Fritz, told CNNMoney that interest in his clients has boomed since the remarks. While Sherman's current endorsements amount to just a bit more than his $550,000 NFL salary, Fritz believes there are millions in deals that will be signed soon, -- some before the Super Bowl is played Feb. 2. "We have some new players who have come to the table who are starting the conversation," Fritz said. The remarks caused an immediate sensation -- positive and negative -- in social media and on sports talk radio, among fans accustomed to bland comments from winning players. Some advertisers fret about the controversy generated by the rant. But Fritz thinks the rant was more positive than negative for Sherman's image. "I think that he's more likeable," he said. "People love this. The brand managers love this." Outside experts agree that advertisers are more likely to be attracted by Sherman's new celebrity than scared off by the controversy. "He's going to be the very hot interview in next couple of weeks. I'm sure you're see someone take advantage of him," said Jordan Schlachter. executive vice president, sports for The Marketing Arm, a firm that arranges endorsement deals. Bob Dorfman, editor of the Sports Marketers Scouting Report and executive creative director of Baker Street Advertising, said that the NFL's defensive players don't get the endorsements that offensive stars such as Denver quarterback Peyton Manning get. So the rant has elevated Sherman in advertisers' eyes. 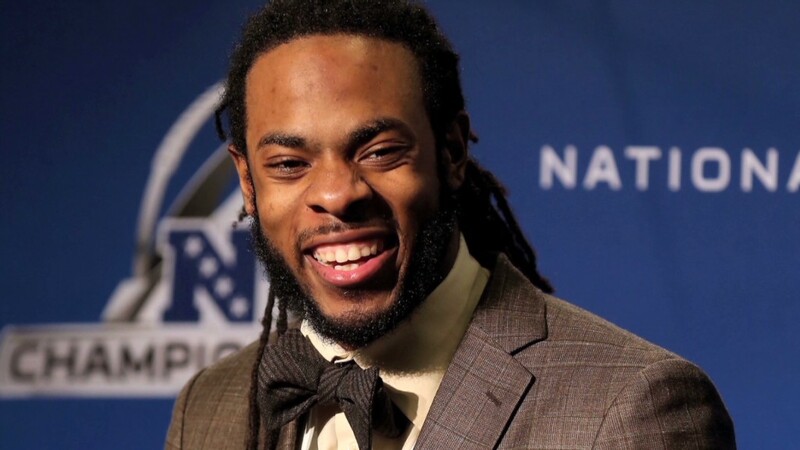 Sherman, who was his high school's salutatorian graduated from Stanford and started a masters degree there his final year playing football there. Before Sunday's game he had few endorsements. His first two national ads aired during the game -- one for Beats by Dre headphones, the other a Nike (NKE) spot that focused on Kobe Bryant in which Sherman makes a cameo appearance. He also has a regional ad campaign in the Pacific Northwest for Internet service provider CenturyLink (CTL). Fritz said even if he's not the star of the Super Bowl, he thinks advertisers' interest in his client is now secure. "Win or lose, I don't think it changes the landscape of opportunities for Richard Sherman this offseason," he said.